Space Shuttle pilot Frederick Gregory began his career flying Combat Search and Rescue missions in Vietnam and rose to serving at the highest ranks of NASA. He flew 550 combat missions in Vietnam, earning the Distinguished Flying Cross. Retrained as a fixed wing pilot he was selected for test pilot school before being ‘loaned” to NASA. 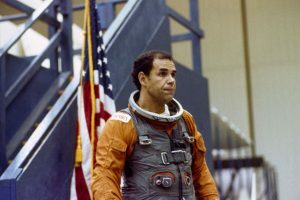 Fred was selected as one of thirty five astronauts by NASA in 1978 and became the first African-American Space Commander when he commanded mission STS-33 on board the space shuttle Discovery. A veteran of three space shuttle missions, he has logged over 455 hours in space. He shares his experiences in combat, in space and his thoughts on where space exploration should be going in the future. Fred went on to serve as Deputy Administrator of NASA before retiring.